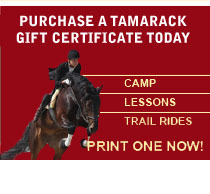 Tamarack Stables offers day camp programs throughout the year. These programs provide campers with the opportunity to learn about horses, their care, and how to ride them. We combine these magnificent animals with a beautiful outdoor setting, professional equestrian instruction, and a healthy dose of plain fun. Camp starts at 9am and ends at 4pm each day. SWIM HORSES IN THE CREEK & POND, ETC. We have approximately a dozen instructors at Tamarack. Many of our instructors have been riding with our program for over 30 years, and some have been teaching with us even longer. In addition to our instructors, we have several barn staff members who help us throughout the summer with horse care and assisting campers. Finally, the most valuable asset to our staff is our horses. We have over 25 school horses. Our school horses range in age and ability from the professors, to babysitters, playful buddies, and teachable youngsters. Each camper rides and cares for the same horse all week. There are no One-Day Camps currently scheduled. Please check back soon. Discounts may be available when you register for more than one day camp. There are no announced Spring Break Camps. Please check back soon. Thank you for a successful 2015 Summer Camp season! Space is limited!! Please sign up early for the weeks that you want. Reservations are not confirmed until payment is received. We recommend registering and paying online by clicking the "Register Now" link for the camp you wish to attend. Registration is NOT complete without payment. If you have questions, or would like to check on availability, please email, or give us a call at 703-339-5160.